"You Might Be an Engineer If..."
I sat stunned yesterday while listening to the radio report of the shooting at the Capital-Gazette newspaper offices in Annapolis, Maryland. 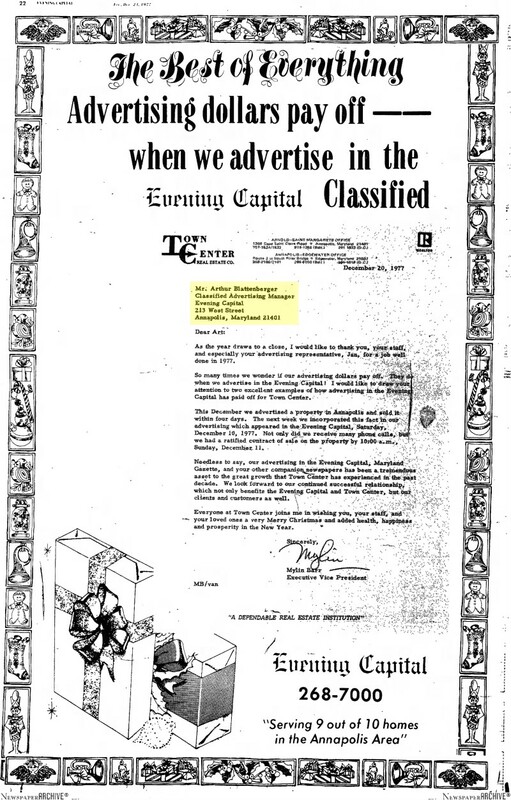 My father, Art Blattenberger, was the classified ad department manager there for more than two decades, back when it was called the Evening Capital, and was located downtown on West Street. Even though Annapolis is 300 miles away from Erie, the event still feels close to home. My sisters still live in the area, but none work at The Capital. "Nippon Telegraph and Telephone Corporation and Tokyo Institute of Technology have jointly developed an ultra high-speed IC for wireless front-ends that operates in the terahertz frequency band. This new IC technology has achieved 100 gigabit per second (Gbps) wireless transmission data rates in the 300 GHz band. The details of the technology were presented at the 2018 IEEE MTT-S IMS 2018 in Philadelphia last week. Terahertz waves are being used for a wide range of research projects as this is one frequency where wide frequency bands ..."
"The advent of precision guided weapon technologies has greatly reduced the military's 'cost per kill,' along with the associated logistics and supply costs for maintaining a large number of conventional munitions in inventory. Key to this advance is the integration of advanced guidance, navigation and control (GNC) systems using laser, electro-optical, infrared, radar and/or GPS signals to direct the weapon to its designated target. To counter this threat, adversaries are increasingly turning to electronic attack measures to disrupt the operation of these GNC systems. Mitigation of adversarial attack is accomplished through the integration of self-protection capability ..."
"In 1965, a renowned Princeton University physicist theorized that ferroelectric metals could conduct electricity despite not existing in nature. For decades, scientists thought it would be impossible to prove the theory by Philip W. Anderson, who shared the 1977 Nobel Prize in physics. It was like trying to blend fire and water, but a Rutgers-led international team of scientists has verified the theory and their findings are published online in Nature Communications. 'It's exciting,' said Jak Chakhalian, a team leader of the study and Professor Claud Lovelace ..."
"Qorvo, a leading provider of innovative RF solutions that connect the world, high-performance, X-band front end modules (FEMs) designed for use in next-generation active electronically scanned array (AESA) radar. These export-compliant gallium nitride (GaN) products also meet the need for high RF power survivability essential for mission-critical operations. The demand for RF front end components for radar applications is expected to exceed $1B by 2022, growing at 9% CAGR over the next five years. The market for RF GaN devices ..."
"IBM threw down a challenge in March of this year when they built what they claimed was the world's smallest computer. The IBM computer is smaller than a grain of rock salt, but computing engineers around the world decided they'd attempt to go smaller. The challenge also didn't sit well with a team at the University of Michigan who previously held the record for world's smallest computer. After months of development, the Michigan team announced they've bested their corporate challengers. The computing device they created measures only 0.3 mm on a side ..."
"In the photoelectric effect, a photon ejects an electron from a material. Researchers have now used attosecond laser pulses to measure the time evolution of this effect in molecules. From their results they can deduce the exact location of a photoionization event. When a photon hits a material, it can eject an electron from it provided it has enough energy. Albert Einstein found the theoretical explanation of this phenomenon, which is known as the photoelectric effect, in Bern during his 'year of wonders' 1905. That explanation was a crucial contribution to the development of quantum mechanics, which was under way at the time, and it earned him the Nobel Prize in Physics in 1921 ..."
"In the 1950s, NASA engineers were looking for a quiet place to build a network of large radio antennas. The idea was to build a series of antennas with huge parabolic dishes and receivers that could detect extremely faint radio signals. After scouting multiple locations, they selected a remote stretch of the Mojave Desert near the ghost town of Goldstone and the U.S. Army's Fort Irwin - an area. This was a great choice as the region had no interference from power lines or commercial radio and television transmitters. The first antenna built at the Goldstone Deep Space Communications Complex was the aptly named Pioneer Station. The 85-foot antenna ..."
"Researchers at Pacific Northwest National Laboratory, funded by the U.S. Army Tank Automotive Research, Development an Engineering Center, have developed a new process for joining aluminum and steel parts with the aim of lightweighting combat vehicles for more agility and fuel efficiency. The development fills an important gap, particularly when it comes to joining thick aluminum plates with steel. The DoE's Vehicle Technologies Office is also examining the technology for automotive applications. Lab testing found that the joints resulting from the new process, called friction stir dovetailing (FSD), are not only stronger, but demonstrate 5 times higher ..."
"A joint research team of the Technical University of Munich (TUM) and the Research Centre Jülich has printed patterns onto gummy bears. A joke of underchallenged or bored scientists? Certainly not: What looks like gimmickry at first sight could change medical diagnostics. On the one hand, the scientists around Prof. Bernhard Wolfrum did not print an image or lettering, but a microelectrode array. These components consist of a large number of electrodes and can measure changes in the electrical voltage in cells. These occur, for example, during the activity ..."
"In the new quantum information technologies, fragile quantum states have to be transferred between distant quantum bits. Researchers have now realized such a quantum transmission between two solid-state qubits at the push of a button. Data transmission is the backbone of the modern information society, on both the large and small scale. On the internet, data are exchanged between computers all over the world, most often using fibre optic cables. Inside a computer, on the other hand, information has to be shuttled back and forth between different processors. 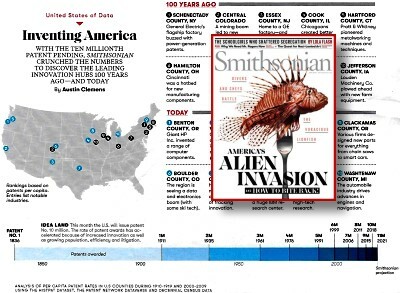 A reliable exchange of data ..."
Smithsonian magazine's Austin Clemens created this map (click thumbnail) of the U.S. showing where the innovation hubs were a century ago compared to now. The occasion is the U.S. Patent and Trademark Office (USPTO) processing its ten millionth patent. America's westward expansion during the period is made obvious by the concentration of black dots (20th century) versus blue dots (21st century). You will eventually be able to read this online at Smithsonianmag.com (page 19), but for now you will have to get the magazine - try your library. "'Our brain is a fantastic computer,' says Professor Tamalika Banerjee from the University of Groningen in the northern Netherlands. The brain, after all, has the ability to process vast amounts of information with an energy efficiency far superior to that of today's computers. By integrating storage, memory, and processing into one unit, however, Banerjee and fellow physicists at the University of Groningen hope their semiconductor device someday supports a parallel computing architecture that rivals the workings of the brain. Banerjee's research group studies spintronics ..."
Ransom Stephens has an interesting article on the EDN website titled, "Hypnotizing Test Engineers with Figures of Dubious Merit." Ever increasing specification complexity makes deciding which parameters to test for and even how to legitimately make the measurements. "Since the dawn of time, standards documents have specified maximum and/or minimum values for design parameters to assure product performance and compatibility. Maximum allowed values for jitter, noise, insertion loss, rise and fall times, minimum extinction ratios, eye height and eye width. Everywhere you looked, a simple measurement screamed yay or nay, stay or go ..."
"Scientists have synthesized a new cathode material from iron fluoride that surpasses the capacity limits of traditional lithium-ion batteries. As the demand for smartphones, electric vehicles, and renewable energy continues to rise, scientists are searching for ways to improve lithium-ion batteries - the most common type of battery found in home electronics and a promising solution for grid-scale energy storage. Increasing the energy density of lithium-ion batteries could facilitate the development of advanced technologies with long-lasting batteries ..."